Schlock-Wire: Scream Factory Guides NOMADS Onto Blu-Ray In August – Schlockmania! If you’ve never been frightened by anything, you’ll be frightened by this! 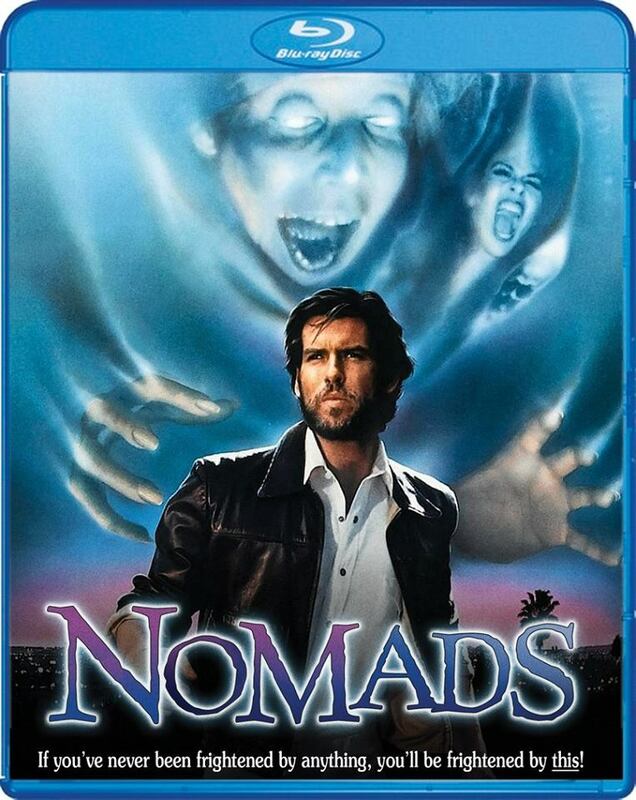 Scream Factory presents Nomads, the chilling tale of supernatural evil, in its Blu-ray debut on August 18, 2015, complete with new bonus feature interviews. Lesley-Anne Down (Sphinx, Death Wish V) “gives a riveting… performance” (L.A. Weekly) and Pierce Brosnan (GoldenEye, The November Man) is top-notch in “the most stylish supernatural-themed chiller… since Carrie” (Variety)! Also starring Adam Ant (Slam Dance), Mary Woronov (Death Race 2000) and Frank Doubleday (Escape from New York) and written and directed by John McTiernan (Predator, Die Hard, The Hunt for Red October), Nomads is a “chiller thriller [that’s] brimming with menace and suspense” (Judith Crist)! They creep. They kill… and no one knows who they are or where they came from. But when these rootless, demonic spirits descend on a determined doctor, all hell breaks loose. Bitten by a dying madman named Jean Pommier (Brosnan), Dr. Eileen Flax (Down) becomes the vessel for his turbulent and insane thoughts. Thrust into his last days, she is shocked to discover the existence of mysterious and murderous demons on a quest for destruction… and begins her own quest to somehow stop them before she joins Pommier in his horrifying fate!